The freight of a transport truck was damaged Wednesday night when the truck attempted to manoeuvre along 1 Street Southwest in the underpass below the railway tracks and the pedestrian walkway of the Canadian Pacific Railway building. 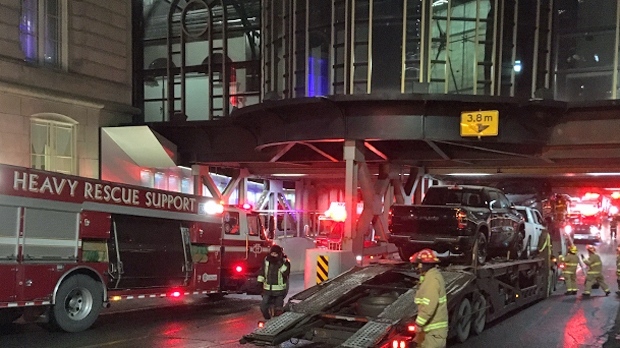 Fire crews were called to the southbound lanes of the underpass at around 7:00 p.m. after four vehicles, that had been perched atop the trailer, collided with the lower deck of the overpass and one became wedged. The passage has a clearance of 3.8 metres. 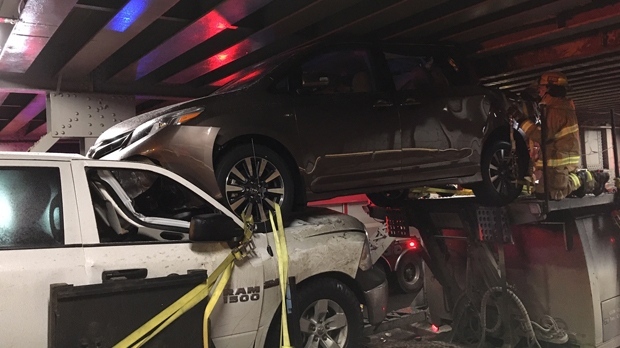 Members of the CFD heavy rescue support to help stabilize the car hauler and its load as City Wide Towing began its attempt to remove the vehicles from the underpass by reducing tire pressure. 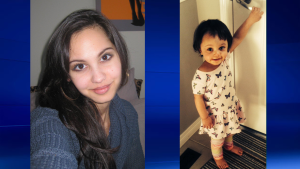 CP Rail deployed an engineer to assess and ensure the structural integrity of the bridge. The extent of the damage to the structure has not been confirmed. Freight trains continue to utilitze the bridge.